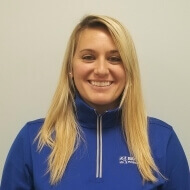 Barbara is a graduate from the University of Rhode Island obtaining her Bachelor’s in Kinesiology and her Doctorate in Physical Therapy, joining Bay State Physical Therapy in 2008. Her clinical experiences have consisted of orthopedic, sub-acute and pediatric settings with a strong interest in sports medicine. She has extensive experience with post-operative rehabilitation and the geriatric population. Clinical outreach includes Couch to 5K training program, health fairs, community races, and working with adolescent athletes for injury prevention. She consistently participates in seminars and courses regarding current research and advances in physical therapy. Aquatic physical therapy and temporomandibular joint therapy are areas she has a strong interest and consistently treats clients in these areas. She enjoys spending time with her family, boating and camping in the Berkshires, and is an avid New England sports fan. She is the Managing Partner at both Stoughton Bay State clinic locations.